BBVA Compass Visa Signature Card Reviews - The Best Low-Interest Card? The BBVA Compass is a little-known credit card with an industry-leading interest rate and a modest rewards program you can use to book airline tickets at a 1.25% rewards rate. 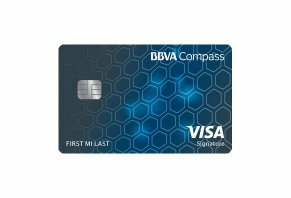 The BBVA Compass Visa Signature card is offered through BBVA bank and boasts a 0% introductory APR on purchases and balance transfers, as well as rewards points for purchases. The card is the flagship credit offering from BBVA, a bank based in Argentina and relatively new to the United States. Though the bank might be new, the benefits and rates the BBVA Compass Visa Signature offers are time-honored and, as you’ll soon see, pretty similar to what you’ll find with other cash rewards credit cards. That’s simple enough to say, but to get to that point we had to do some in-depth research into what the card offers now and down the road, the rates and fees you can expect to pay, the opinions of experts and fellow consumers as well as how this card stacks up against other cards with similar rewards. What we found during our research is what you’ll read here. Once we walk you through all the details we mentioned above, we’ll finish off with some general thoughts about the BBVA Compass Visa Signature and give you links to some recent articles we’ve written about credit cards and credit scores. For most consumers, finding the right credit card is all about the one option that gives you the most rewards, whether it’s free travel, low APR on balance transfers or cash back. In our opinion, there’s really nothing wrong with this as long as you know how to manage your spending so you can have good credit scores and low debt. But, before you sign up for a card, you should know what bonuses you’ll get in the short-term and what kind of long-term benefits you’ll receive. Based on our research, you’ll be most happy if you can hit the sweet spot between those two benefits. Short-term benefits should be thought of like a welcome gift at your new job. Let’s say you get hired at an office and, on your first day, your boss takes you out to lunch to commemorate your new job. Free lunch is a short-term benefit. The interest rate on purchases for the first six months is straightforward. Any purchases you make within six months of the day you were awarded the card aren’t subject to interest. As long as you pay off all those purchases before the six-month deadline, you won’t pay any interest charges. If you don’t pay them off before the deadline – even if your balance is $5 – then you’ll have to pay interest on all the purchases you made during the first six months. Our advice? Pay your balance off in full, every month and you’ll never have to worry about interest charges. The introductory rate on your balance transfer will be based on your credit history. If you’ve got great scores (above 740), you’ll probably get 0%. If you’ve got bad scores (620 and below), there’s a good chance you’ll get 3.99%. The same rules apply to balance transfers as they do to purchases. If you have any balance left over after the 12-month deadline, you’ll pay interest on the entire balance transfer amounts you made during the intro period. Remember how we said up-front benefits are like the free lunch your boss buys you on your first day? Well, the long-term benefits of the card are like the treatment you get when you’ve been at your job for a year. Are the health benefits good? What about vacation and sick days? How easy is it to get a raise? The free lunch your first day was nice, but it’s the long-term benefits that will keep you happy over time. So, yes, you get zero-interest APR on purchases and, in some cases, balances transfers, but once those benefits disappear, what are you left with? Well, at the time of publishing, the BBVA Compass card had two valuable long-term benefits: points and the Visa Signature protection suite. Whenever you make purchases with your BBVA Compass Visa Signature, you get one point for every dollar you spend. Those points are automatically deposited, usually at the end of the month, to your CompassPoints account. From there, you can convert those points to cash that’s added as a statement credit. You can also redeem them for travel and gift cards. Well, their cash value is one penny per point, which is standard for nearly every credit card rewards program. Here’s how it works: You get $10 for every thousand you spend. If you want to cash out your points, the lowest amount you can cash out is 2,500 points, or $25. What’s interesting here is that the cash value of your points actually goes up when you book airline tickets. Doing a cash redemption gets you 1% of your points, but redeeming them for airline tickets gets you a 1.25% rewards rate. That airline rate is the same rate you get when using your Chase Sapphire Preferred card through the Chase Ultimate Rewards portal. In our opinion, that’s a great deal, but it gets better. Nearly every credit card on the market sets up your rewards bonuses, which are certain categories of purchases that get you more than one point per dollar. The drawback to this method is that you can’t personalize your bonuses. If you live in the city and you use public transportation, you don’t have any use for a 2x bonus on gas purchases. In our opinion, BBVA has done a good job of letting consumers choose the categories that most benefit their rewards. The second big long-term benefit you get with this BBVA Compass card is the series of travel and shopping protections/insurance available through the Visa Signature program. We’ll do a quick overview of those benefits in just a second. Before we do though, it’s important to remember that each one of these perks has its own rules and parameters for how much you get paid and under which circumstances you get paid. Also, you’ll only get the benefits if you use your BBVA Compass card to pay for the items in question. Lost Luggage Reimbursement: You’ll be reimbursed up to $3,000 for any luggage lost by your airline carrier. Some of the things that aren’t included in this reimbursement are business items, cell phones, art objects, contact lenses, eyeglasses, sunglasses, prosthetic limbs, food, perfume, cosmetics, cameras and sporting equipment. Auto Rental Collision Damage Waiver (CDW): Reimbursement for any accidents or damage you sustain while renting a car. Travel and Emergency Assistance Services: Various services including medical referrals, lawyer referrals, emergency ticket replacement and lost luggage locator. Purchase Security: Anything stolen or damaged by fire, vandalism, weather or accidental water spill can be reimbursed up to $500 within 90 days of the purchase. Warranty Manager Service: An extended warranty of one year for any items with manufacturer’s warranties of three years or less. Travel Accident Service: A $500,000 payout for a variety of severe and debilitating injuries sustained while travelling that were not self-inflicted. Zero Liability: You aren’t liable for fraudulent purchases. The really interesting thing about this card’s rates is the low-end APR of 11.74%, which is 1.75% lower than the next lowest card we’ve reviewed: Barclaycard Ring. In our opinion, this low-end APR is a great perk because it can save you hundreds of dollars in interest payments every year. That being said, you’ll only be charged an interest rate if you don’t pay your balance in full. The reviews of this card are few and far between. Why? Well, the credit-card review world tends to focus on credit cards from Chase, Discover, and American Express. Every once in a while, you’ll see a review of a card from Barclays. Other than that, cards from smaller banks usually don’t make the review cycle. While we certainly understand that the BBVA Compass Visa Signature card doesn’t have quite the ring to it that the Chase Sapphire Preferred card has, that’s no reason to leave it out of the discussion about rewards cards that could benefit you. CreditCards.com, in our opinion, gives the card the best treatment out of all the sites that reviewed this particular credit card from BBVA Compass. We also think the effect of the foreign transaction fee is overstated, too, because several other popular low-interest cards have foreign transaction fees too: the Citi Simplicity, Chase Slate, and Citi Diamond Preferred come to mind. Each of these cards is a low-interest card, which is an important distinction to make because none of the leading cash-back cards have foreign transaction fees. You could classify the BBVA Compass Visa Signature card as a cash-back card, in which case the foreign transaction fee is high. Our verdict? This card is a hybrid of low-interest and cash-back. One thing’s for sure – none of the cash-back or low-interest cards we’ve reviewed offer an APR as low as the BBVA Compass card’s 11.74%. We really think this card is intriguing because it’s often forgotten by major credit-card and travel-rewards websites. You won’t find a lot of reviews on this card, and you’ll find even fewer ratings from customers. In our opinion, this is a shame because the BBVA Compass Visa Signature should warrant some serious consideration for consumers with excellent credit. We put “excellent credit” there because, if you’ve got a top-notch credit score, you’ll probably get the card’s 11.74% interest rate, which is, based on our experience, a true unicorn of a rate. Up until this year, the Barclaycard Ring had the lowest APR of 8.25%. However, Barclays jacked that rate up more than 5% this year, making it an average card. Another thing we love about this card? The 1.25% rewards bonus you get when you book airline tickets. This bonus puts the card’s redemption rate for airfare on par with the Chase Sapphire Preferred. While the balance transfer rate on this card is 1% higher than most other cards, we think the long-term APR you can get will make up for this. For example, if you transfer a balance of $5,000, you’ll end up paying a fee of $200 instead of the $150 you’d pay with a card that has a 3% balance-transfer fee. However, your interest rate on that balance (if you get the 11.74% rate) will save you hundreds of dollars a year over a more popular card (we’re thinking a Chase card, here) with a low-rate of 15.49%. We’ll admit that the BBVA Compass Visa Signature isn’t a popular card, but it should be in discussions about underrated credit cards. In our opinion, it’s a good fit for consumers who usually carry a balance and have high credit scores because the low APR will save you nearly 4% in interest over any of the cash-rewards or low-interest Chase cards. If you like what you’ve seen from the BBVA Compass Visa Signature but you want to research other cards before making your decision, stop by our credit card page to read reviews of all the most popular credit cards on the market today. Not only will you get access to in-depth credit card reviews like this one, but you’ll also get to read our Best Credit Cards of 2017 articles as well as our helpful section on credit scores. Write a Review for BBVA Compass Visa Signature Card!